The conservatory kit has been re-designed. All components within the kit are manufactured utilising the latest computer controlled CNC technology. The double opening doors have hinges. 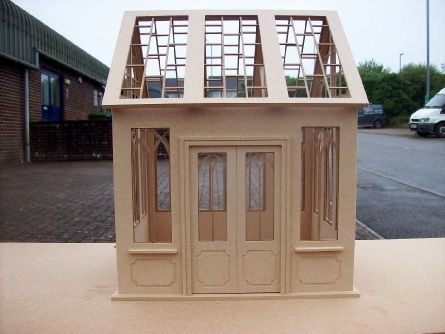 The windows have been manufactured from 2 mm MDF. The window rebates have been machined down to 4 mm to allow you to use your own glazing if required. The roof section shows all the inner details with the beams being exposed. The bottom of the eaves have been drilled through for you to add hanging baskets etc. The roof section also lifts away from the main building. An optional glazing pack is available.